Good Bye May, Blather, Blather?!? Oh May, May has come and now is almost gone. Last Bento of The School Year! 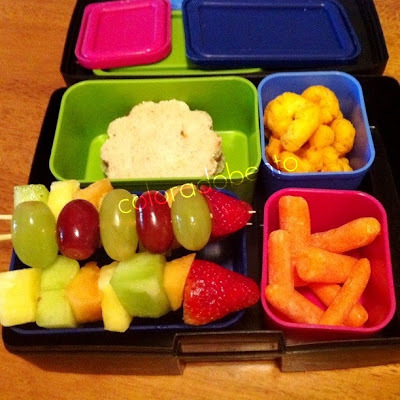 I find it hard to believe, but this morning I packed the last bento for my second grader, soon to be third grader. Amazing! Applegate Farms baked ham, tillamook medium cheddar, whole wheat organic tortilla pineapple baby carrots vegetable sticks Annie's granola bar in nibble size pieces and a very special last day home made brownie! Summer shall be hit or miss, but I may share what the girls are eating in general! Believe it or not, we are on the cusp of six months in our home and I still haven't grown accustomed to some of the noises our place makes. I am completely embarrassed to admit the other day I was sitting on the couch and jumped up to look out the window because I thought I heard the garage door open. For a moment my mind led me to believe my husband was surprising me and calling it a day mid-afternoon. Turns out, what I heard was the washing machine. Maybe that's some insight as to how much laundry I've been doing lately. our hamster is doing her aerobic work out on that darn squeaky wheel. I wonder at what hour comes the peace and quiet? On Monday I downloaded the app for my iPhone called My Fitness Pal. It's also a website, in case you are interested in starting a journal of the foods you eat, with the added bonus of nutritional information built in. While I use the word, DIET, with much hesitation using MFP is like being on a diet. For the most part I feel like I eat very healthy, but I have some lingering pounds that I would like to be rid of. I don't exercise consistently, which is also another problem. I feel very fortunate that there are no peanut restrictions at my daughter's preschool. I understand how incredibly serious nut allergies are, but the school believes in teaching the children how to handle real world situations (which includes foods you may be allergic to). 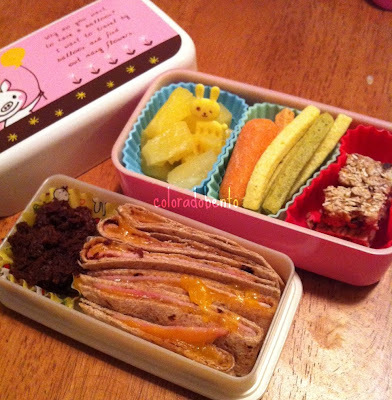 There is one child with a nut allergy, but he doesn't go to lunch and isn't in my daughter's class, if he was I am sure I would refrain from sending nuts in her bento. 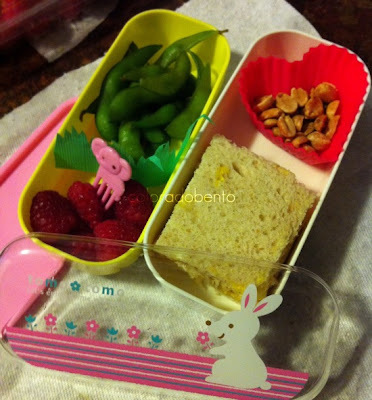 Organic edamame, raspberries, cheese sandwich, and some peanuts. We've all referred to the hours after school as the "witching hour". You know those couple of hours that endless drag on, Monday through Friday. The kids are starving, but we don't want to feed them too much so we don't ruin their dinner. There is homework to complete, uniforms to launder for the next day's practice, and dinner to prepare! 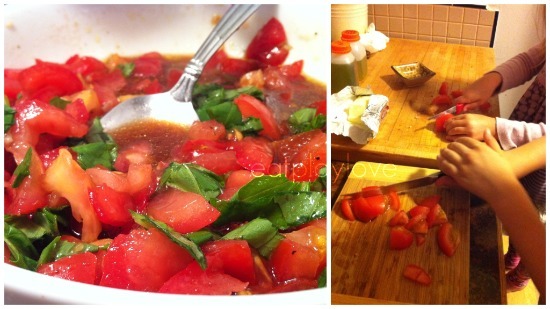 Typically my girls start to bicker right when I am in the middle of preparing dinner. I can almost time when my oldest will open the pantry door in search of a granola bar, it's about 15 minutes before dinner is on the table. If I could hire a mother's helper, it would be from 3-5:30 during the week. Instead I allow the girls to watch television, just so I can get through dinner preparation. Tri-colored pasta with a little balsamic vinaigrette, vintage cheddar, ham, raspberries, blackberries, and some rice crackers. No bread, no problem. I try my best to not get down about the weather, I mean I live in Colorado a place that boasts over 300 days of sunshine a year. But lately it's been colder than average and rainy, with even a few snow storms mixed in for good measure (yes in MAY, sigh). In an attempt to wash away the Winter feeling Spring days, I've been making sure I don't miss tea at 4pm daily. I will admit I drink tea through out the day, but having tea in the late afternoon gives me the little boost I need for the dinner into evening hours. 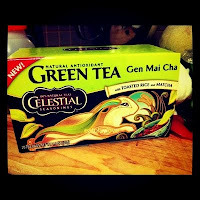 Bonus, green tea is full of antioxidants, which is why I prefer green tea. Do I serve Treats In Bentos? Yes, I'm guilty. 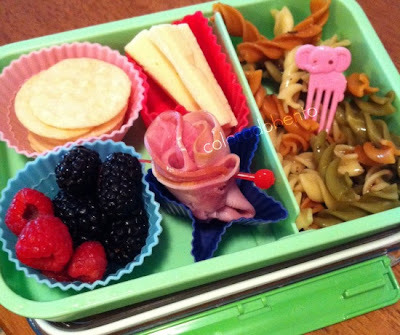 Sometimes I give in and add a special treat in my daughters' bentos. It's maybe once a week and when a treat is unexpected, that makes it even better. They know it's not a regular thing, so they better eat a good lunch first before enjoying it. 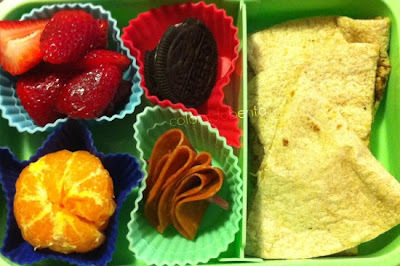 Strawberries, clementine, Applegate pepperoni, whole wheat tortilla & vintage cheddar quesadilla, and an organic chocolate sandwich cookie. Science With Girl Scouts, Is It A Lesson or Is it a Craft? It's Both, Thanks to Steve Spangler! Some of you may be surprised to learn that I am a Girl Scout Troop Leader. I volunteered to take on the position after a group of girls showed interest in forming a troop (Sj included) in the Fall. When I was a child, I spent only a year in Girl Scouts as a Brownie, so my experience with the organization in general was very limited. I didn't let my inexperience stop me, I just went for it. Luckily for me the girls are very eager to learn and always happily jumped right into whatever activity I had planned. In many ways it was great to be working with a group of children again, even sweeter that it wasn't over 30 students, which I was accustomed to when I was teaching full time. Fruit Kabobs, Always a Hit! I'm not quite sure what makes fruit so much more appealing when it's on a little bamboo skewer, but my girls have yet to tire of fruit kabobs. They love them, so I love them. We made rolls for dinner last night, so I was sure to save enough sushi rice to make Sj a roll for her lunch today. I don't make the roll the night before because the nori can get soggy and in turn very chewy, which to me presents a bit of a danger for the kids to eat. Cucumber, avocado, sushi rice w/a side of Brocco Shoots. Joyful Rabbit contains gluten free, gmo free Tamari. I've been somewhat superstitious about writing this story. I had to wait until we were through the potential "window for disease to appear" before I could comfortably share what happened. I will eagerly admit now, the guilt that came flooding through my body was almost stifling. Many lessons were learned from this one incident. 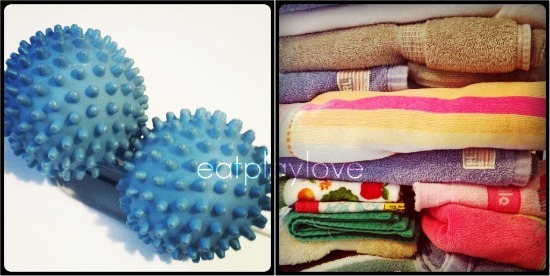 Tuesday Tips: I'm Sorry But Your Dryer Sheets Are....Toxic! In the mid-90's I started to phase out traditional cleaners in our home. Following the birth of our first daughter a decade later, I became super sensitive to what cleaners I would allow. 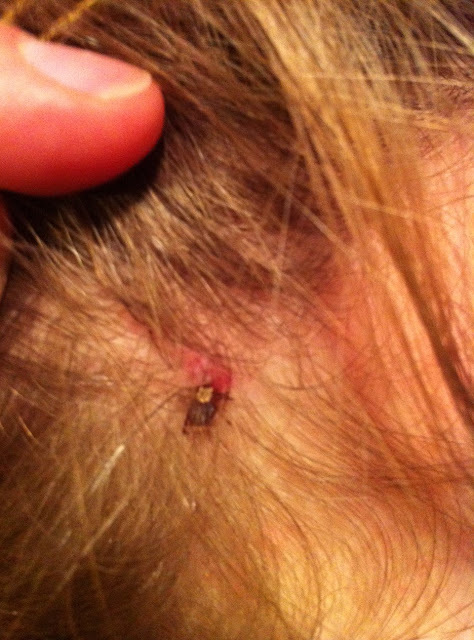 Sj developed eczema very early on and typically such reactions are allergy based. My instinct as a mother was to tow the line and rid our home of the last few traditional cleaners that we relied on.